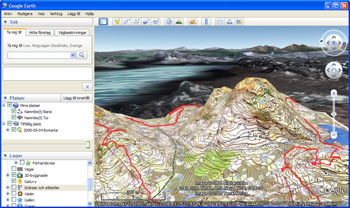 QuickRoute is a computer program for Windows that allows you to display a route from a GPS device, such as a GPS-clock, on an orienteering map saved as an image file. The main purpose of QuickRoute is to make it quick and simple to transfer your route from a GPS device onto a map. To run QuickRoute on Mac OS X, a virtualization software like VMware Fusion or Parallels Desktop is required. There is no native Mac OS X version of QuickRoute. QuickRoute has built-in support for GPS devices in the Garmin Forerunner series. Other devices that can produce data files in the GPX format are also supported. Integration with Google Earth gives great opportunities to analysis of geographical data. An installation of the Microsoft .NET Framework 2.0 is needed in order to run QuickRoute. QuickRoute is being developed as a spare-time project by Mats Troeng and Jörgen Ohlin. 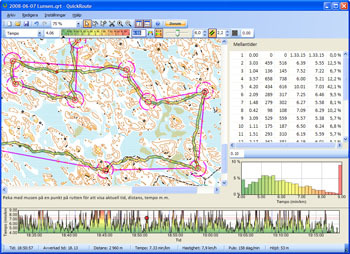 The program holds commercial class, but is free to download and run as a consequence of the developers' love to the orienteering sport. If you have any questions or suggestions for possible improvements of the program, go to QuickRoute's user forum. Get notified when new versions are released by subscribing to the QuickRoute version history rss feed.